Home » Largest Known Ancient Megalith Discovered—Who Really Made It? Largest Known Ancient Megalith Discovered—Who Really Made It? Baalbek is an ancient complex of temples located at an altitude of approximately 3,800 feet (1,150 meters), at the foot of the Anti-Lebanon mountain range. One of the most incredible features of this complex is the Temple of Jupiter, built by Romans in the 1st century A.D. It rivaled the grandest temples of the Roman Empire. At its foundation are three megalithic stones of about 800 tons each. But more impressive still are carved megaliths at a quarry about a mile away, one of which the German Archaeological Institute announced in early December to be the largest stone carved by human hands ever discovered. Its weight is estimated at 1,650 tons; it is 64 feet (19.6 meters) in length, 19.6 feet (6 meters) wide, and 18 feet (5.5 meters) high. Because this megalith so resembles the smaller, but nonetheless impressive megaliths part of the Temple of Jupiter, the prevailing theory is that the Romans also carved it. It is assumed that the Romans only realized after carving this and the other megaliths at the quarry (1,000 tons or more each) that they were too heavy to lift. It is also said that one of the megaliths wasn’t used, because the stone quality at one of the edges was poor. But researcher Graham Hancock isn’t so sure. He thinks the Romans were better planners than that. Hancock hypothesizes that these megaliths were carved by a much earlier civilization, dating back perhaps some 12,000 years, and the Romans just built around them. He wonders if they are contemporaneous with the megalithic site of Gobekli Tepe in Turkey. Why, asks Hancock, would the Romans go to all the trouble of forming these massive blocks and not simply cut them down to smaller ones so the work wouldn’t be wasted? We know that the Romans used smaller blocks to build upon the megalithic platform at Baalbek, so why open fresh quarry faces and not use what had already been worked here? He made a research trip to Lebanon in July to take a look at the megaliths himself. He thinks the megaliths in the quarry were unknown to the Romans, covered in sediment at that time, as the newly discovered block was until recently unearthed. 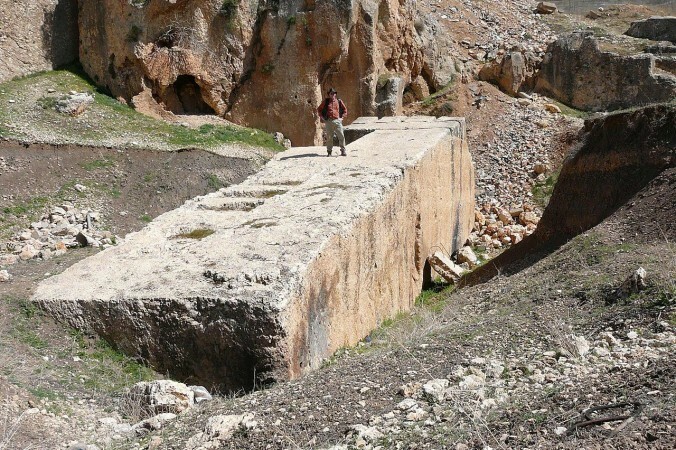 Supposing the Romans did quarry these stones and decided they could move the three 800-ton ones to Baalbek for the temple, but not their heftier cousins—how were they able to move the 800-ton megaliths? This remains a mystery even to those who support the conventional theory. From about 7,000 B.C. it is known that the Phoenicians used the site for the worship of a triad of fertility gods (Baal-Shamash, Anat, and Aliyan). Though no known civilization advanced enough to make and move these megaliths is known, Hancock continues to investigate. Much mystery still surrounds this site, and Hancock does not claim to be able to explain it all. He says he only questions the prevalent theory and he will continue to research his own hypothesis.